Enjoy the #1 rated contests and sweepstakes app. Run seamless giveaway and contest campaigns on your Apple or Android device, and easily capture leads even if you’re offline. Use our mobile contests and sweepstakes app to easily collect lead data no matter where you are. Works with iPad, iPhone, or Android tablets and devices. Add logos, change colors, customize background images, and more to create beautifully branded mobile surveys for giveaways and contests. Spotty internet connection? No problem! Safely collect data offline without losing your info. No Wi-Fi needed! All data is stored in the app until you reconnect. Let potential leads participate in a scratch off or “swipe to reveal” game by allowing them to uncover one of up to eight prize images on a mobile device or tablet. Identify the winners of a contest or sweepstake automatically by selecting a survey response randomly and showing it on your screen. Add an email field to your contest survey to capture emails for lead nurturing. Shortcut buttons and email validation make it easy to collect valid emails quickly. Turn your tablet into an interactive kiosk at a conference or while you’re out in the field. Set your survey to loop automatically, and easily track uptime and performance. Automatically calculate a score for each sweepstake or contest lead you collect based on their responses. Each response is tallied to create an overall lead score. Send customized follow-up emails to people that completed your survey. Thank them for participating in your contest, or notify them that they’re a winner. With QuickTapSurvey’s sweepstakes and contests app, the Tennessee Titans decreased their post-event follow-up campaigns from 3 weeks to 24 hours and increased lead follow-up rates by 50%. Easily connect your surveys to apps like Zapier, Salesforce, and MailChimp for easy data transfer. Update your CRM with new lead information, add contacts to your email database, send text messages to participants, and much more. Enhance your lead capture anywhere. Run a lead capture campaign at your next event and include a sweepstake or contest. Run a giveaway at your checkout counter or front desk to encourage signups and feedback. 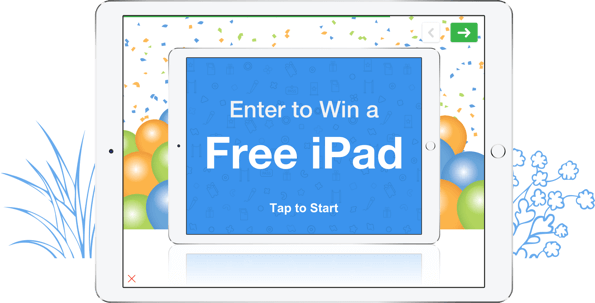 Use a contest or giveaway to attract more people to your booth and collect more leads. Get up and running quickly with online contest and sweepstakes templates already prebuilt for you. Run high-converting, app-based contests and giveaways. Take a test drive of QuickTapSurvey’s sweepstakes and contests app by starting a free trial. No credit card required.